Following last year’s release of their Ultimate Michael Myers figure and the upcoming Ultimate Laurie Strode, Neca just yesterday unveiled their new retro-styled Michael Myers Clothed Action Figure, only to out do themselves yet again today with photos from the ongoing New York Toy Fair confirming that a Halloween II Ultimate Michael Myers figure is coming this year, as well as a three-pack of trick or treaters in Silver Shamrock masks from Halloween III: Season of the Witch! UPDATED: We now have our first look at Neca’s officially licensed Halloween II (1981) Ultimate Michael Myers figure, which stands at over seven inches tall with more than 25 points of articulation, and comes with three different masks, including the “blood tears” and Ben Tramer, and even the opening credits jack-o-lantern that actually opens up to reveal a skull inside, plus syringe, knife, and hammer accessories. It comes in display-friendly deluxe window box packaging with opening flap. 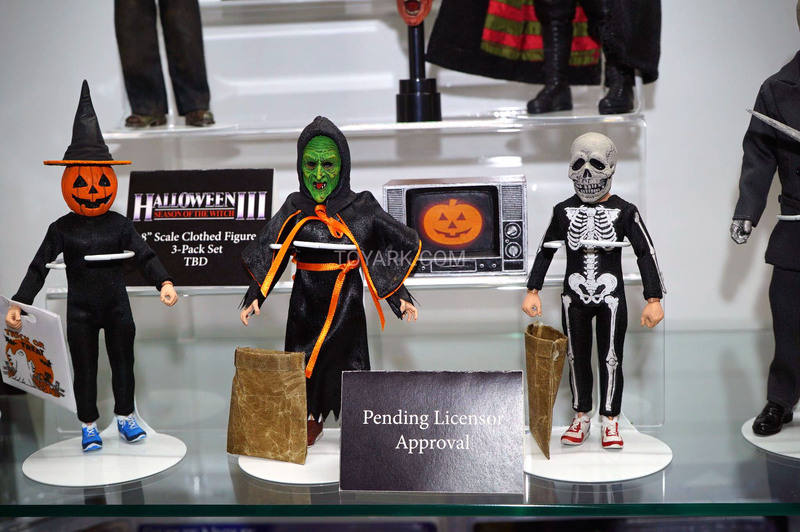 The first ever officially licensed Halloween III: Season of the Witch three-pack of figures includes three trick or treaters, each wearing one of the Silver Shamrock masks from the film, joining Neca’s retro-styled Mego-inspired Clothed Action Figure line. Also unveiled today at Toy Fair, a new 18-inch version of the Halloween 2018 Michael Myers released last year. The new Halloween II and Halloween 2018 figures from Neca are currently scheduled to be released in the third quarter of 2019, while the Silver Shamrock pack release date is still to be determined. You can see some photos of the new figures in the gallery below, and then head over to Toy Ark to see all of Neca’s upcoming horror releases revealed at New York Toy Fair.